The ES-4124 provides 24 10/100Base-TX ports plus 4 GbE uplinks. 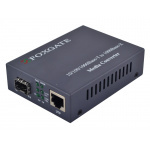 This is also an ideal Fast Ethernet solution for building converged networks. ZyXEL Switch 4000 Series are intelligent multilayer (L2/L3/L4) Ethernet switches providing enterprise-class availability, resilient and redundant architecture with OSPF, VRRP, RSTPand port trunking. The Switch 4000 Series offers many advanced features that make it the preferred choice for real-routing enterprise networks. Advanced functionalities like QoS, ratelimiting, rule-based access control lists, multicasting support, wire-speed, high-performance IP routing and simplified management software (iStacking) all contribute to the excellent efficiency of network operations. The ZyXEL Switch 4000 Series delivers fully dynamic wire-speed IP routing features like OSPFv2 and RIPv2 using a hardware-based IP routing engine, as well as sophisticated multilayer operating software that quickly and precisely transmits Layer-3 traffics without packet loss or latency. In addition to dynamic IP routing, the ZyXEL Switch 4000 Series supports DVMRP, IGMPv3 and MVR for most applications on today’s IP-based multimedia platforms. With the ZyXEL Switch 4000 Series, enterprises can easily employ applications such as IP TV, video conferencing and distant learning. become more and more complicated and diverse than ever. To assure the multi-service quality on a converged network, adopting advanced traffic control technologies to manage different type of traffic flows is critical and necessary to enterprises. 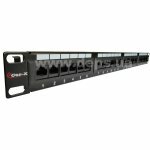 The ZyXEL Switch 4000 Series supports Intelligent QoS features to optimize network traffics. With supports to Class of Service (CoS) and Differentiated Services Code Point (DSCP), administrator can easily classify and perform traffic prioritization for business-critical applications such as VoIP and video conferencing. In addition, the Switch 4000 Series provides advanced bandwidth control with granularity of 64 kbps and 8 hardware priority queues to bring better bandwidth administration to network operators. Information Security is a critical issue in the era of information economy. In addition to preventing threats from the WAN, enterprises also need LAN security to protect intellectual properties. The ZyXEL Switch 4000 Series provides a complete set of security features to protect important data, administrate traffic and secure the enterprise network. Through the multilayer (L2/L3/L4) ACL suite, the network administrator can easily check the source and destination information in MAC address, IP address, Ethernet type and TCP/UDP for security and QoS requirements. With 802.1x authentication and port security, administrators can reject unauthorized users from accessing the network. The ZyXEL Switch 4000 Series supports the VRRP routing protocol for failover transmissions, while BPS, the second DC power source, protects the system from internal AC power supply failure. 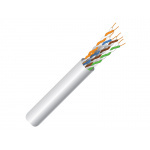 The IEEE 802.3ad Link aggregation reduces network downtime by providing more packet paths and bandwidth aggregation to critical paths. The Gigabit uplink not only gives superb transmission bandwidth, but also allows users to set up Gigabit aggregation to secure transmission on critical paths, while the IEEE 802.1w Rapid spanning tree (RSTP) allows immediate recovery from failed links by sending packets via a backup link path. 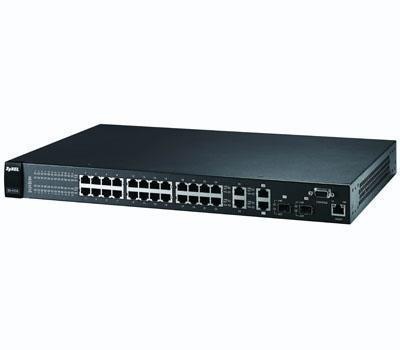 The ZyXEL Switch 4000 Series provides various network management options. Networking administrators have the freedom to choose the friendly Webbased configuration or the convenient text-based CLI (Command Line Interface) to manage the switch. Since the Switch 4000 Series supports centralized SNMP-based management software, maintenance can be performed remotely. 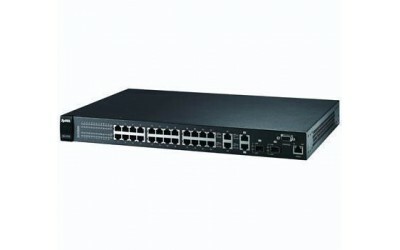 The Switch 4000 Series also supports the ZyXEL-exclusive iStackingTM clustering management technology that works across different floors and routing domains to locate other iStacking-capable switches in the same cluster, allowing administrators to manage up to 24 switches with one single IP. This greatly reduces operating costs and offers flexible maintenance to ZyXEL Switches.